If you think blackened redfish with a couscous cake topped with caramelized basil might be an interesting dish to try, you’ll want to meet Chef Tim Spain. Known in the area as the “Florida Fishing Chef,” Tim is a catch-and-release fisherman who casts a line in almost daily and said he has never killed a fish on purpose. Tim was the executive chef at Fusion Restaurant until last May, when management announced the restaurant was closing. Now Tim is looking to share his culinary skills by offering cooking lessons and private catering jobs. You can tell by the way he describes his dishes how passionate he is about food, and he is a natural teacher. Tim learned how to become a chef after spending a year working at a restaurant in Bordeaux, France. When he returned from France, he spent nine summers working in the kitchen for a yacht club in Mackinaw Island, Michigan, eventually becoming the executive chef. He also worked as a chef in Big Sky Montana and Key West during the winter months. He previously worked for a large healthcare company, where he managed the food and beverage services in several large hospitals. Tim shares his ideas and gourmet recipes on his website, cheftimspain.com. “My idea for the website was to market myself and be available to teach people culinary classes or help organize their kitchens,” he said. There are farm-to-table recipes and chef’s choices on the website. One part of the site also lists a variety of exotic wines paired with fresh tapas. “I just love what I do, and I like to share my ideas with other people,” he said. Tim is a ninth-generation Floridian. “We are true Florida crackers,” he said. Tim is also a wine steward. He passed his sommelier exam, and he enjoys pairing certain wines with different kinds of foods. 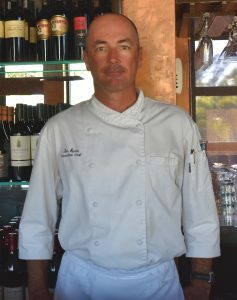 Before working at Fusion, Tim was a chef at La Corte Garden Bistro in Cape Coral for several years. He’s also the resident chef for the Fox 4 Now WFTX Morning Blend television show. Tim said cooking is like art, and the final presentation of the meal is very important. He also chooses to never include garnishes that are not edible, because it would be wasteful. To check out some of his recipes, visit cheftimspain.com. For more information about booking a catering event or cooking lessons, call (406) 580-1994.